Cars and trucks — and a bus –on I-5 near Cottage Grove on September 9. 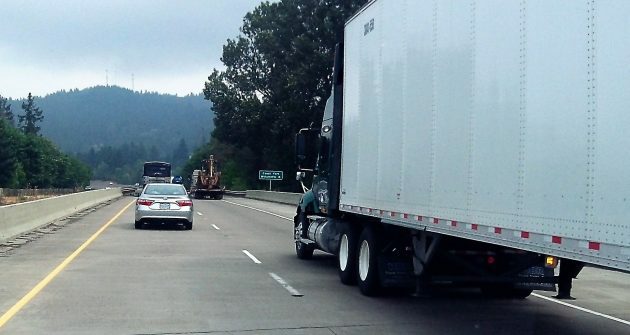 Will raising the speed limit for trucks make a difference on Oregon freeways? We’ll find out as soon as ODOT gets around to completing the paperwork and installing new signs. Meeting in Salem last Friday, the Oregon Transportation Commission approved the recommendation of a committee that the posted speed limit for trucks be raised from 55 to 60 mph on most segments of interstate highways. The change was recommended by the state’s Speed Zone Review Panel and was based on the report of an engineering investigation. In the report, the state traffic/roadway engineer recommended raising the truck limit to 60 mph on all the freeway segments where the limit now is 55 mph for trucks and 65 mph for cars. One exception: In Roseburg, the report recommended keeping the limit at 55 for trucks and lowering it to 60 mph for cars, the same as on other urban segments of I-5. As I reported earlier, ODOT engineers found that trucks already travel at an average speed near 60 mph. Their report also said that most drivers go at a sped they feel is comfortable and safe. If that’s so, then the increase in the limit will not necessarily raise the actual speeds of traffic on the road. When will we know? ODOT spokeswoman Shelley Snow says the highway staff now will have to write and adopt rules to reflect the commission’s action last week. Then it’s a matter of getting new signs made and installed. She figures the new speed limit for trucks — and for cars on I-5 in Roseburg — will take effect in a couple of months. Prior to this rule change, Trucks are already traveling at 62 mph. ODOT acknowledges this reality, but raises truck limit to 60 mph anyway. Trucks which were previously driving 62 mph will continue to do so. The only difference being that if a vehicle is only 2-mph over the posted limit, versus 7-mph over under a 55-mph, even the narrow possibility of a moving violation traffic fine for speeding disappears. Yet another chipping-away at respect for the rule of law caused, in part, by the lawlessness running amuck in the current administration. And this, in spite of the fact that President Trump has all his pumps running at full speed, draining the DC swamp. 1. Just returned from a road trip thru the northern mountain and plains states. Even when the posted limit allowed more, most trucks had no issue with my 60 mph. Heck, I drive 65 on the freeway, and trucks already frequently pass me, so they must already be going 10mph over the limit.. So, perhaps this may save some tickets for the truckers, unless they decide that 60mph means 72mph. “How laws get passed: you pass a law, they break the law, they change the law to match the way you broke it.” “Everybody” knows that you won’t get ticketed if you go six miles per hour over the posted limit. So truckers go 61. The legislators, in their “wisdom,” change the limit to 60 and guess what’s going to happen? Of course! The truckers will go 66! So we can look forward to parity between sixteen- (or more-) wheelers and cars. This will, of course, lead to more slow-left-lane passes by the trucks and more congestion. Mostly in Salem, one can hope.